Want to give IZ as a gift? Everyone loves getting gifts in the mail and in this day and age of instant gratification and digital everything, we can send people gifts via email. Going beyond an ecard, we give you the ability to email any of IZ’s albums or ‘Over the Rainbow‘ to anyone you want with our gift checkout feature. 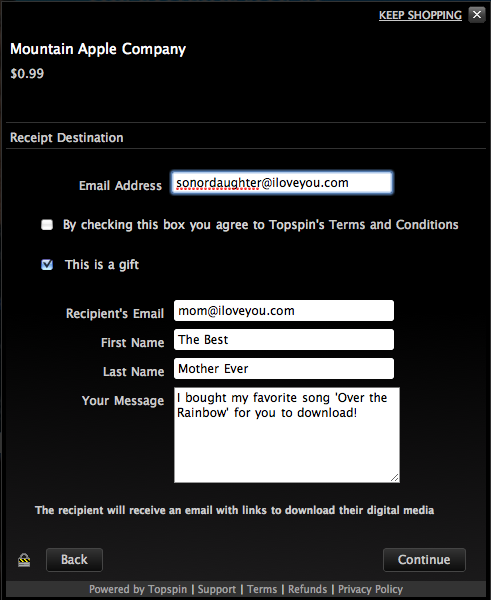 When you click checkout, you’ll see a window with a small checkbox that says “This is a Gift”. Click that and once your purchase is complete, the recipient will receive an email with a download link that requires nothing but a click. This feature is also available for our CD’s, Shirt’s, DVD’s and Book’s, we will just ship the items to them for you. Try it with ‘Over the Rainbow’! There are 2 comments on Want to give IZ as a gift? I would like to use your song over the rainbow on a movie I have made of my diving its only a 5 minute clip for face book and friends. Can I have your pomission to use it.